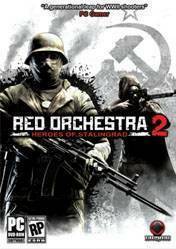 Red Orchestra 2 is a realistic first-person shooter. Guns behave realistically, with bullet drop and spin taken into account. The game also takes away with elements of a traditional HUD like an ammo counter, forcing players to remember, or manually check, the approximate amount of rounds that are left in the gun's magazine. When reloading a weapon, the character checks the weight of the new magazine and determines if it is heavy (full or close to full) or light (empty or close to empty). The game's first person cover system allows players to hide behind all objects in the world to avoid gunfire. While in cover players can peek out to take more accurate shots or fire blindly. However the shape, size and composition of the object changes its effectiveness at protecting the player. Smaller objects may not cover the player's entire body and some may not stop bullets. Health does not regenerate over time or by use of medical equipment, but non fatal wounds must still be bandaged so no more health is lost through blood loss. There are Tanks in Red Orchestra 2, with more vehicles to be added in after the game's launch. Great game and still has quite an active community. Definitely pick it up. I love this game a lot!